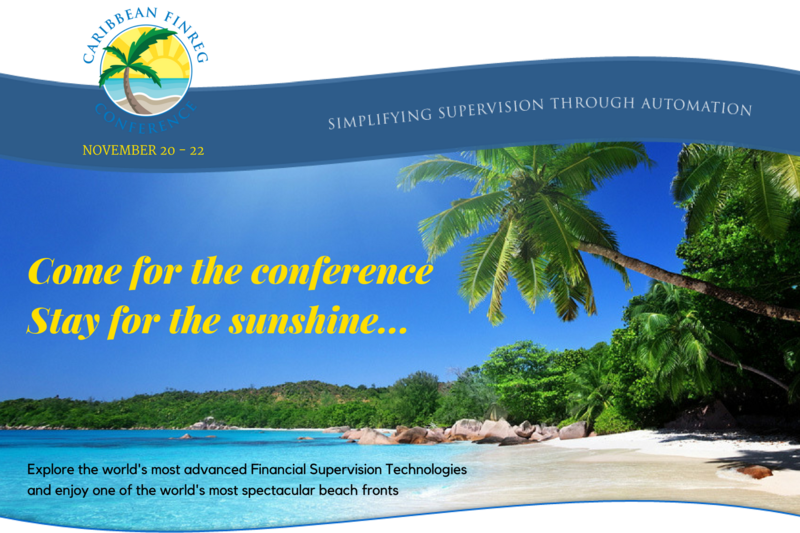 We’re Off to the Caribbean FinReg Conference this November! Today's regulators are under tremendous pressure across three dimensions: the pace of change, the ever-increasing dynamics of risk and limited resources with which to respond. Fortunately today, advancements in technology and automation has enabled easy access to clean, high quality data like never before. Financial regulators across the Globe are looking to leverage the power of data, insights and analytics through automating their legacy systems and manual processes and take compliance to the next level. Join us in our quest to make Financial Regulation more effective through cutting edge software technology and automation at the Caribbean Financial Regulatory Conference 2017! This international showcase of world-class regulatory solutions, hosted in one of the most beautiful locations on Earth, features industry-innovating speakers from around the globe who will focus on the importance of using technology, and the move towards structured data to improve efficiencies, automate and streamline all regulatory oversight functions. The Caribbean Financial Regulatory Conference 2017 includes speakers, expert Q&A panel, and hands-on workshops for financial regulators. Check out the full conference agenda. Mark your calendar and join us in the beautiful Cayman Islands from November 20th to 22nd, 2017. The conference and guest accommodation is booked at the Grand Cayman Marriott Beach Resort, a luxury 5-star hotel centrally located on world-famous Seven Mile Beach and is within walking distance to shopping, dining and entertainment. Register before September 30th using the Promo Code EARLYBIRDFINREG to receive a 20% discount off the Conference Registration fee!